If you have jewelry that is broken, or too short, or too long, or fit grandma… but doesn’t fit me, or the clasp is gone, this is for you. 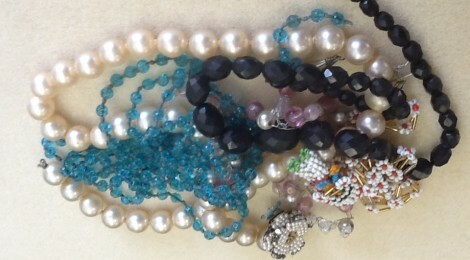 Bring your old, new, broken or just not quite right jewelry and we will work through the pile to make much of it wearable. You’ll be amazed how we can work a little magic and you’ll be wearing that piece again. Silver/gold work or soldering not included. Provided: We'll have tools available to use. Bring: Any jewelry that needs to be repaired, restrung or needs attention and items you ight have... jewelry tools, clasps, chain, jump rings and jeweler's cement. Please do not purchase any items until you know what you need as you repair the jewelry you have brought to the clinic.